The natural state of a dense forest, known for its hiking trails and and beautiful surroundings, is the canvas for Foresta Lumina. 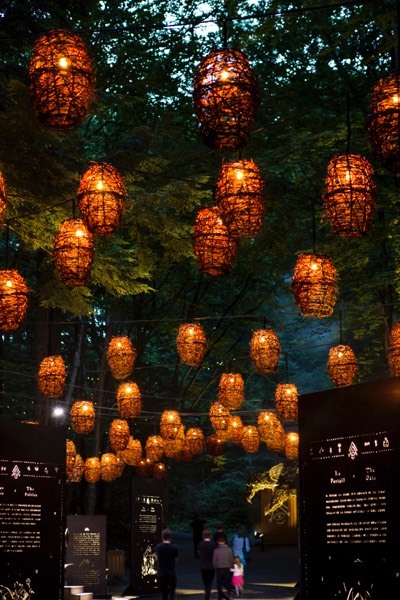 This immersive and multisensory nighttime experience along a 1.5 mile stretch was inspired by forest mythology and local legends. The adventure begins by crossing the Gorge on one of the world’s longest pedestrian suspension bridges. Visitors carry a map of the trail and will first encounter a mysterious, misty portal that is located on the bridge itself. Passing this portal takes visitors to the Garden of Wishes. Here, seven beautifully illuminated manuscripts introduce the cast of fictional characters that inhabit the park’s nocturnal landscape. Mysterious runes tie the interactive storyline together. Each character is carefully designed and presented with sophisticated lighting, audio, mist and a variety of theatrical effects that create a moody but magical setting. Experiences with mapped media and lighting effects gain popularity every year. The creators of Foresta Lumina were tasked to adapt these modern technologies to a living environment that calls for nuance in its scale and execution. It is the unique forest setting and local folklore, balanced with the subtle adaptation of multimedia that makes the project stand out.